Mark was the keynote speaker for our annual user conference. His message was on point and well received. He worked with me to tailor the message to fit our audience. His performance is high energy and engaging. He kept the audience involved from the beginning to the end. WE WORK WITH COMPANIES THAT WANT TO UNLEASH THEIR INNER ROCK STAR POTENTIAL, BY TAPPING INTO THEIR ROCKSTAR MINDSET & SHOWING YOUR TEAMS HOW TO PERFORM AT A HIGHER LEVEL. BE THE ROCKSTAR & INVITE MARVELLESS MARK® TO SPEAK AT YOUR NEXT EVENT! What Are the Key Takeaways That the Audience Will Learn From Las Vegas Rockstar Speaker Marvelless Mark? Marvelless Mark not just a business expert who’s coming to talk at your people. He is going to get your entire crowd electrified, Imagine everyone in your audience pumped out of their minds to perform better in business next year. Audiences don’t need to hear another presentation on what to do. Mark’s presentation is unlike any other keynote presentation in the world. It’s an experience that creates a new rock star mindset for moving to the next level. Your people will get plenty of educational information in their breakout sessions. However, they also need an emotional, motivational boost, a chance to let go. Receiving inspiration drawing from why to learn and perform, to how to perform at the highest level. That… is a rock star performance. Las Vegas is a city with a personality all its own. When you have your meeting or conference at the # 1 convention city in the world, you need to wow your attendees and show them that what happens in Vegas doesn‘t stay in Vegas… it changes them forever. 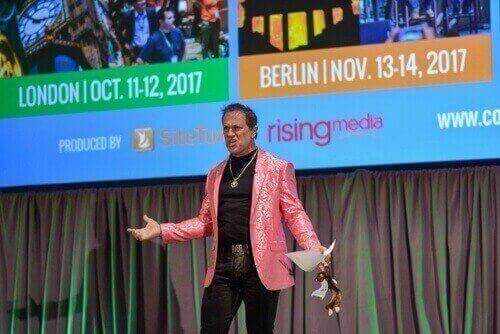 In order to make your meeting or event memorable, you need to hire a bold, unique keynote speaker who eats, breathes, and sleeps Las Vegas. You can’t take a chance of the venue outshining the entertainment. You need rock star content, rock star delivery, and rock star results. Luckily, when you hire Las Vegas Keynote Speaker Marvelless Mark, you get it all. 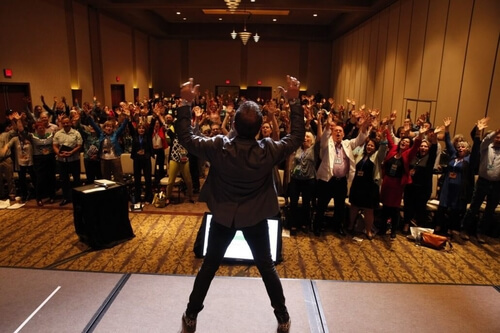 A motivational keynote speaker is more than just 45 minutes of entertainment at an event. A motivational speaker is a way to energize your employees and inspire them to step out of their comfort zones and embrace their inner rock star. Imagine what it would be like if your team were fully energized and working together to rock your business. 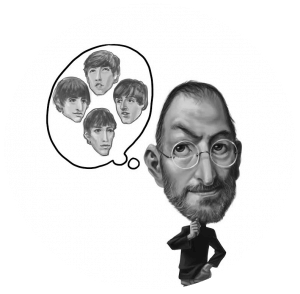 Using his 3 Keys to Rock Star Teamwork, your employees will learn to adopt a positive mindset, work together, and unleash their inner rock stars. They’ll return to work with a renewed passion for their roles. Your audience will learn, laugh, get on their feet and get ready to take action to transform their business. With Marvelless Mark’s® special Rhythms in Business® finale, they may even get to pretend they’re Led Zeppelin’s John Bonham or The Who’s Keith Moon. The bottom line is that you need a big personality for your next event. You need someone who’s going to leave a lasting impression on your team and motivate them well after the event has ended. And, wouldn’t it be nice not to worry about a speaker missing their flight and missing your event? 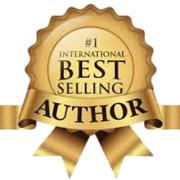 Las Vegas Keynote Speaker Marvelless Mark is your solution. His keynote, “Opportunity Rocks” is named after his book. 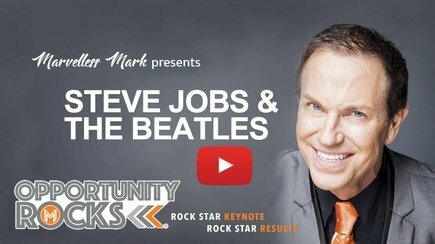 He’ll show your team how to be business rock stars, no matter what the industry, by applying the success secrets of your favorite rock stars – along with some serious business content – in an interactive keynote event designed to illustrate a powerful message of Vision, Action, and Change. His unique style on Business Change will inspire your attendees to Dream bigger, Drive Change and most importantly take Action. 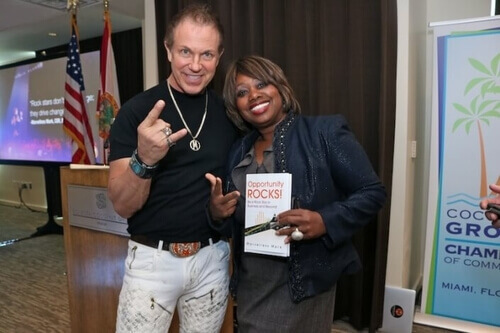 Las Vegas motivational speaker, emcee, team building speaker and meeting icebreaker with the ability to take any meeting to a place bursting with rock star energy, interaction, and fun with a message. 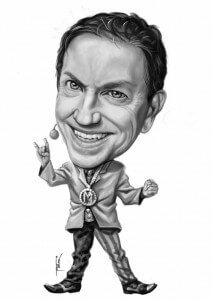 As a former radio personality and Las Vegas Headliner, Marvelless Mark’s approach to corporate entertainment was always one of audience participation, interaction, and rock concert energy. Mark has carried over to his keynote speaking, connecting with your audience to set the tone and pace for your meetings. Let’s talk about how to make this work for your corporation’s message and inspire your team to work as a band. Not many people can say they’ve headlined a show in Las Vegas… but Marvelless Mark Kamp can. Even fewer people can add “meeting the love of their life while headlining a show in Las Vegas” to their list of accomplishments. Mark starred in a show at the Venetian for 4 years before focusing on his professional speaking career. He grew up on a farm in Missouri before lending his voice to the radio and taking the entrepreneurial world by storm. 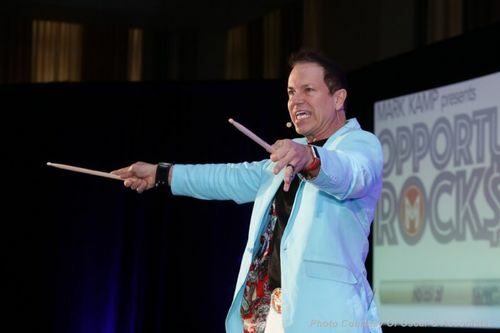 Considered the customer and employee engagement guru, Mark’s been sharing his energizing and unforgettable presentations with Las Vegas audiences for over 25 years. His audiences are entertained, excited, and learning new strategies to impact their business. 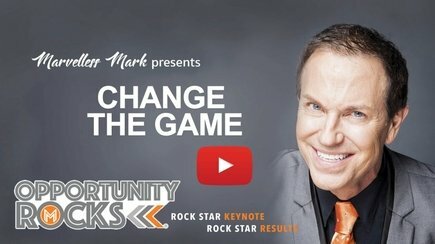 Author of the acclaimed book Opportunity Rocks, Marvelless Mark has been featured in USA Today, Business Innovators, TBN, and Small Business Trendsetters. 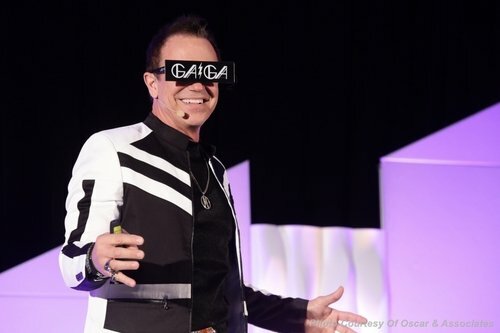 He brings his enthusiasm in his mission to unlock everyone’s inner rock star through speaking engagements in Las Vegas and all over the world. 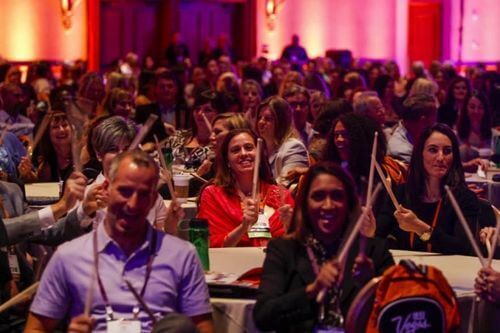 Your audience will be laughing, drumming, and unlocking their inner business rock stars. If you are looking for a High Energy, Inspirational, Engaging, Speaker for your next event, then look no further! Marvelless Mark Rocked the house at our national convention in Vegas! Besides the obvious high energy he brought to our event, his message was relevant and practical for our attendees to use in their business and everyday life. As a person who works with many keynote and thought leaders, I can honestly say that Mark was as positive and awesome to work with behind the scenes in the planning of his time with us as he was on stage. Mark will ignite your team with passion and light a fire under them. My team and I experienced a renewed energy and began performing at higher levels on a daily basis. You rocked ‘em 15 years ago but now you are 100 times better, bigger and cooler than ever! You blew NetVu away and made me look like a hero J Thank you! This was the best conference in the last 10-15 years. Dude…YOU ROCK! 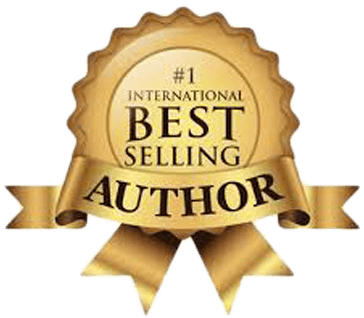 As an award-winning Las Vegas Keynote speaker, Marvelless Mark has entertained audiences in a variety of industries. His presentations bring audiences to their feet as they drum along, fully engaged in the action. A Las Vegas local, Mark is no stranger to the different venues in town.